Wallet-friendly rates free Wi-Fi and complimentary breakfast add up to a value-packed stay for guests at the non-smoking Americas Best Value Inn of Clear Lake. The non-smoking Americas Best Value Inn has two floors that house 30 rooms all featuring free Wi-Fi and flat-panel TVs as well as coffeemakers and mini-fridges. Mornings here start with complimentary breakfast. The front desk is staffed 24 hours a day. Pets are allowed for a small fee and parking and local calls are free. 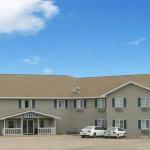 The hotel is about 15 minutes west of the Minnesota borders on Highway 15 in the small town of Clear Lake. Natural local attractions include Clear Lake a mile away and Ulven Park less than three miles from the hotel. Guests travel 35 minutes to Watertown to visit the Redlin Art Center and Bramble Park Zoo. Sioux Falls is one-and-a-half hours south of the hotel. Minneapolis-Saint Paul International Airport is 185 miles east.